If you are a golf enthusiast that is looking for the perfect fairway home in Benton Harbor, we can help. 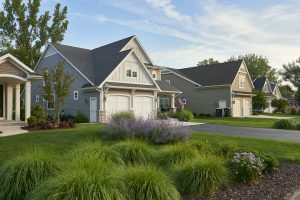 Harbor Shores combines the small-town charm with the benefit of year-round world-class amenities. Come and see for yourself why a Harbor Shores Benton Harbor fairway home is the perfect vacation home, or even better, your primary home. To learn more about our available fairway homes, please do not hesitate to call us at 269-932-1600 and speak with an experienced agent that will be able to answer any question that you may have. Or if you would rather send us a message, please do not hesitate to fill out the form found on this page and we will contact you as soon as we can. Harbor Shores features a variety of homes spread across our community, which is only a stone throw away from Lake Michigan. Each of our luxurious fairway homes is maintenance free, which grants you the ability to sneak that second round of golf, the only thing stopping you is your schedule. We feature a variety of neighborhoods, each one with unique features, but all share the same atmosphere of golf and fun. With neighborhoods like the fairway signature golf homes, which put you in a fairway home that is a front-row seat to any championship hosted on our award-winning Jack Nicklaus Signature Golf Course. Or the Enclave neighborhood, which overlooks the 6th fairway, you are never far away from tee time. If you would like to learn how to secure your fairway home today, please call 269-932-1600 to speak with a knowledgeable agent that can answer your questions. You can also send us a message by filling out the form found on this page, and we will contact you shortly.